Perhaps we were being a little sadistic, but there was also a little romance behind that wish. The orange ball was unique to the snow-covered opener two years ago. As any red-blooded Minnesota soccer fan will remember, the most notable thing about the opening day of MLS soccer in Minnesota, March 12, 2017, at TCF Bank Stadium in Minneapolis, was the weather. The temperature at kick off was 19F and a blizzard raged throughout the game. Even the heated field couldn’t melt the snow that fell during the game. The game had to be periodically halted so snow could be cleared off the field lines. Officials used an orange ball. At the time, it was the coldest MLS game ever. It was epic. Not the game, which Minnesota lost to Atlanta United 6-1, but the weather. The author shot this photo from the area of the stands where the NSC staff viewed the MLS opener two years ago. National Sports Center staff members were there in numbers, and to a person we all remember it as probably the most fun we had ever had at a soccer match. Not in spite of the weather; but BECAUSE of the weather. We were invested. MNUFC, and the various professional teams the came before, had played home games at the NSC Stadium since 1990. The NSC owned Minnesota’s pro team, the NSC Minnesota Stars, for one year in 2010. If the NSC hadn’t kept pro soccer alive in Minnesota after the demise of the Minnesota Thunder in 2009, there would have been no professional team for Dr. Bill McGuire to purchase. And arguably, no Minnesota MLS team to take that snow-covered field two years ago. The Loons were our team, and we were proud. Not only proud of our team, but also proud – as Minnesotans can be – of our ability to laugh in the face of miserable weather and triumph. By Thursday evening, MNUFC grounds staff was making good progress on clearing the pitch. Given those memories, some of us have been secretly hoping to bookend that day from 2017 with another epic winter game to kick off the Allianz Field era. The game had sold out months ago, so we had no guilt about that. Snowbanks around the field? Better for television. As game day approached, the prospect of a repeat weather occurrence looked real. On Wednesday evening, three days out, a storm that meteorologists called a “bomb cyclone” hit Minnesota. A half foot of snow and 40 mph winds slammed the Twin Cities. Two days out, schools and interstate highways closed. But this time around opening day would turn out differently. As this article went to press one day out, the storm was wrapping up. MNUFC’s head groundkeeper Ryan Moy had technology on his side. 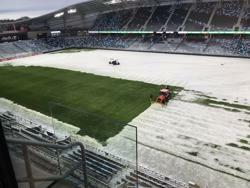 The soil under the turf at Allianz Field was heated to 65F, and Moy had special snow pushers at the ready to clear the pitch without damaging the turf. 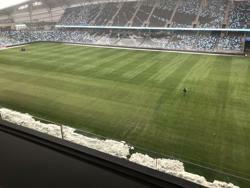 By Friday morning, the snow was off the field, and MNUFC stadium staff was knocking ice off the seats and clearing snow from the aisles. The stage would be ready for the show. By Friday morning, one day out, the pitch was fully cleared on snow. Game on! Friday was a media scrum, as Twin Cities’ reporters converged on Allianz Field to preview the new stadium. They gushed over the throwback analog scoreboard clock, the 96 taps in the Brew Hall, and the 35-degree pitch of the Wonderwall supporters section. The press would have come anyway, but now they could also tell the heroic story of the stadium staff successfully battling the bomb cyclone to make the field, and the stadium, game ready. The forecast for Saturday’s big game is for partly sunny skies and a high temperature of 40F, a full 21 degrees warmer than the MLS opener two years ago. Every seat will be full. The fans will be amped. And if it was up to me, I’d leave a few token snowbanks on the margins, just for ESPN’s cameras. Once again, Minnesotans had laughed in the face of miserable weather, cleared the snow, and celebrated another bright MLS opening day.